Private Jeremy Drexler died May 2, 2004 when his convoy hit an improvised explosive device in Baghdad, Iraq. Also killed in the attack was SPC Ervin Caradine, Jr.
Jeremy Lee Drexler was born to Karl and Debbie Griffin Drexler July 20, 1980 in Fort Leavenworth. “Jeremy was trained to be a fighter and he died a fighter. He felt it was his duty,” his mother, Deborah Drexler, stated. “Jeremy was the kindest fellow who ever lived. He was a very goodhearted and giving person. He would give the shirt off his back if it would help somebody. He was the finest young man you could ever meet,” his mother concluded. Jeremy graduated from Washburn Rural High School in 1999, enlisted in the Army on November 13, 2002 and was deployed to Iraq in January of 2004. Debbie’s last form of contact with her son was about a month before he was killed, when he thanked her for a care package she sent to him that included shampoo, soap, and snacks. PFC Jeremy L. Drexler was 23 years old from Topeka, Kansas. Original portrait presented on May 15, 2009 to his mother during a special event held in Amarillo, Texas. 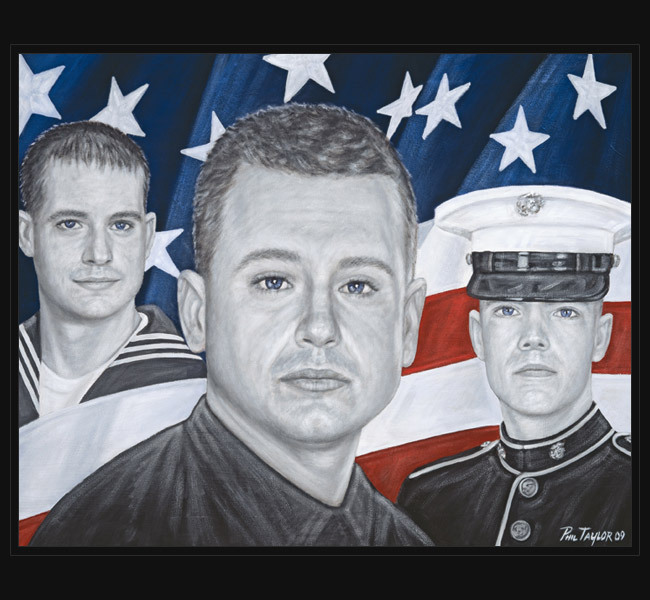 Artist Comment: This portrait depicts Jeremy (Center) with his brothers, both still active in the Marines and Navy. A special gift for his mother, Debbie. Be encouraged and we will never forget!